Synopsis: Have you ever wanted something you couldn’t have? Meet Lionel, a loveable bully-magnet who desperately wants a new sled and will do anything to get it. 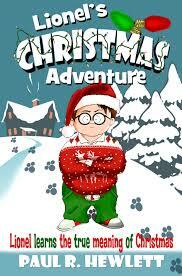 This fun Christmas book follows Lionel from Larrystown to the North Pole. His magical Three-Toed-Potbellied Walbaun foot is back and is as unpredictable as ever. Whether Lionel’s sledding, ice skating, or in a life-sized gingerbread village, it takes him on some grand adventures. Filled with great Christmas imagery, this book is perfect for young readers and family story time. This 2012 holiday, be careful what you wish for, you never know what might happen! The first inkling we get that this is part-fantasy is the mention of the Walbaun foot which, we’re told is ‘lazy and failed to master its magic’. There’s humour and charm all the way through and I smiled at Lionel’s reaction to a local girl, Carrie, as we’re shown how he feels about her rather than told (other than ‘He had a terrible crush on her’). We feel sorry for him on various occasions, the mention of a bully, the lack of Christmas at Lionel’s house which is compensated at his friend Skip’s house and his parents are very kind. With my editor’s hat on, there was very little to pick on but I spotted a typo (‘That snapped Lionel out his trance’ which technically could be correct but sounded odd), a couple of clichés (‘he grinned from ear to ear’, and ‘hair as white as snow’, although it can be forgiven, being a Christmas story, and a children’s one at that. ), unnecessary repetition (‘…found himself coming to the town square. As always, the town square…’) and tense slips (‘this morning’ instead of ‘that morning’, ‘didn’t believe in five minutes ago’ instead of ‘hadn’t believed in five minutes before’). The fact that I was listening to Mrs Kindle dictating Paul’s story highlighted ‘errors’ easier than may have been picked up visually (although I like to think I’m thorough) and it just goes to show how important it is to read your work out loud. There were plenty of opportunities to say “ahh” and Lionel is an unlikely hero with his chubby fingers and lack of confidence and ultimately he learns that material gifts aren’t everything. A charming ‘careful what you wish for’ story. Based in Northamptonshire, England, Morgen Bailey (“Morgen with an E”) is a prolific blogger, podcaster, editor / critiquer, Chair of NWG (which runs the annual H.E. Bates Short Story Competition), Head Judge for the NLG Flash Fiction Competition and creative writing tutor for her local county council. She is also a freelance author of numerous ‘dark and light’ short stories, novels, articles, and very occasional dabbler of poetry. Like her, her blog, https://morgenbailey.wordpress.com, is consumed by all things literary. She is also active on Twitter, Facebook along with many others (listed on her blog’s Contact page). She also recently created five online writing groups and an interview-only blog. Her debut novel is the chick lit eBook The Serial Dater’s Shopping List ($0.99 / £0.77) and she has six others (mostly crime) in the works. She also has eight collections of short stories available (also $0.99 / £0.77 each) – detailed on https://morgenbailey.wordpress.com/books-mine/short-stories. She also helps other authors with an inexpensive freelance editing and critiquing service, and welcomes, and actively helps to promote, guest authors on her blog – see opportunities. Thanks, Morgen for the review. What a fun surprise to see! I hope that you have a very happy holiday season. You’re very welcome, Paul. Having bumped into each other on Twitter (and Facebook? ), it was great to finally read something of yours.